Jack Holloway works alone, for reasons he doesn't care to talk about. Hundreds of miles from ZaraCorp's headquarters on planet, 178 light-years from the corporation's headquarters on Earth, Jack is content as an independent contractor, prospecting and surveying at his own pace. As for his past, that's not up for discussion. But there's another wrinkle to ZaraCorp's relationship with the planet Zarathustra. Their entire legal right to exploit the verdant Earth-like planet, the basis of the wealth they derive from extracting its resources, is based on being able to certify to the authorities on Earth that Zarathustra is home to no sentient species. Then a small furry biped trusting, appealing, and ridiculously cute shows up at Jack's outback home. Followed by its family. As it dawns on Jack that despite their stature, these are people, he begins to suspect that ZaraCorp's claim to a planet's worth of wealth is very flimsy indeed and that ZaraCorp may stop at nothing to eliminate the "fuzzys" before their existence becomes more widely known. John Scalzi won the 2006 John W. Campbell Award for Best New Writer, and his debut novel Old Man's War was a finalist for science fiction's Hugo Award. His other books include The Ghost Brigades, The Android's Dream and The Last Colony. He has won the Hugo Award, the Romantic Times Reviewers Choice Award for science-fiction, the Seiun, The Kurd Lasswitz and the Geffen awards. His weblog, Whatever, is one of the most widely-read web sites in modern SF. 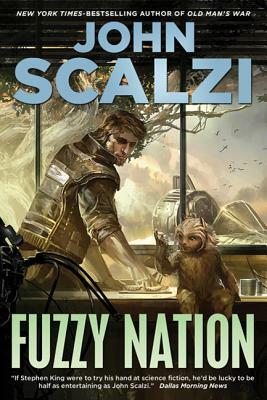 Born and raised in California, Scalzi studied at the University of Chicago. He lives in southern Ohio with his wife and daughter.